Everybody always likes to talk about Myrtle Beach golf rankings, but what are you ranking? Greens & fairways, longest and shortest course, and let’s not forget cost. Let’s take a look at the Myrtle Beach golf rankings for the toughest greens along the Grand Strand. These golf courses are where the greens are the real show! Here are the top 4 Myrtle Beach golf ranking courses for toughest greens. Remember that Myrtle Beach golf rankings are subjective, so this is just one opinion! Part of the Legends Golf Group, play Oyster Bay Golf Links and you will be in for a putting test for the ages. Oyster Bay golf links not only features some of the Grand Strand’s best marsh scenery but some of the most difficult and crazy sloping greens as well. The TifEagle Bermuda greens are kept slightly on the slower side, which is good, because if they weren’t they would be pretty much unplayable. There is even a hole at this course with alternate left-and-right greens, so be sure you're playing to the green with a flag on it - otherwise that'll make an impossible two putt. You don’t dare miss a round at The Dunes Golf and Beach Club! Because the course is semi-private (meaning that you have to book through a package provider or play with a member), the number of rounds played are lower unlike some of the other clubs that are strictly public, therefore the chances of spike marks or pitch marks sabotaging your roll is relatively slim. The Dunes Club has lightening fast, A1 bentgrass greens. Keep this in mind and play your approach shots and chip shots below the hole to avoid the long putts for par or worse. Putting is fun on Barefoot Resort's Fazio Course, thanks to smooth, and usually exceptionally fast A-1 bentgrass greens. The hard part is the size of the greens and the fact that Tom Fazio loves to play with the dirt when forming them and thus, keeps them from at least feeling level. Fazio's shaping of these greens is gradual, so seemingly insignificant breaks can fool you and actually end up being severe, and vice-versa. Critics of course designer Mike Strantz say that the greens of his golf courses usually don’t go with the fairways and the rest of the hole. Whether you appreciate the beauty or just don’t get the often bizarre designs of them, you'll love the imaginative greens at True Blue Golf Plantation. 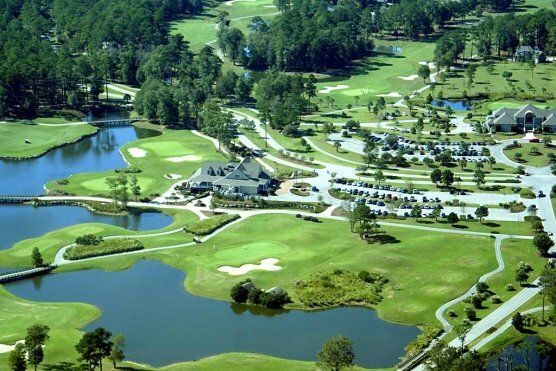 All 18 greens on this Myrtle Beach golf course are different and whether you are playing in the spring, winter or fall the greens are kept firm and fast. Putter beware!